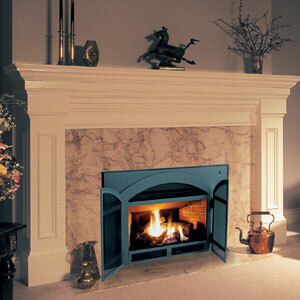 A beautiful blend of function, form and versatility combine to make the perfect Fireplace Insert. 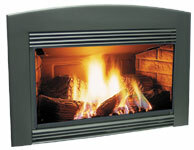 Able to fit into most fireplace openings and available in a number of optional faces and surrounds, the Enviro Focus model also offers the largest viewing area and most beautiful flame pattern available. 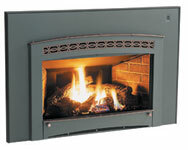 You can heat up to 1600 square feet with 30,000 BTUs input at 80% efficiency with this remarkable Fireplace Insert. Up to 30,000 BTU’s of heat. Up to 80% efficiency rating. Heating capacity up to 1600 sq. ft.
3 piece ceramic fibre brick liner. 4 piece ceramic fibre log set. SIT gas valve with 50% turn down ability. Large viewing glass, Bay 313/4”x 131/2”, Flush 28”x 137/8”. Direct vent with B vent conversion kit. NG with LP conversion kit. Bay door with painted, 24Kt gold or nickel trim. Cast iron bay door in 7 porcelain enamel colours or flat black. Cape Cod face with opening doors. Cottage face with 24kt gold, antique copper, nickel or painted finish. Standard panel with black trim, 28”x42”. Oversized panel with black trim, 33”x46”. Brass or nickel panel trim. Cast Iron surround panel in 6 porcelain enamel colours or flat black, 28”x42”.